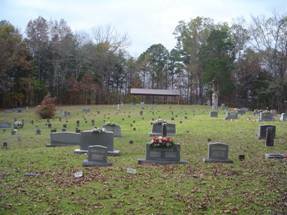 The Culp Cemetery is located on Beech Creek Road in Wayne County, Tennessee. To reach the cemetery, travel Tennessee Highway 13 north from Waynesboro, turning left onto highway 228 (Beech Creek Rd.). 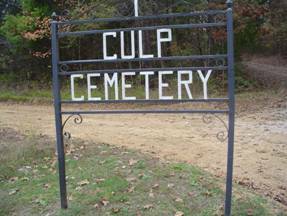 Travel 9 ½ miles and turn right onto Culp Cemetery Road. Drive up the hill for one tenth mile. There is a large number of graves marked with cap blocks & no identification. The cemetery has a drive that circles the cemetery. On August 3, 1980 a Perpetual Care Trust Fund was set up with a board of directors & is now known as The Culp Cemetery, Inc. The enumeration was originaly done by J. Erving & Ermadine Riley & others. Anderson, Harold Douglas; b. 01 Mar 1951, d. 05 Oct 2014, Vietnam vet. Culp, Anna L.; b. 16 Mar 1878, d. 16 Aug 1926, wife of B.S. Culp, Charlie; b. 12 Sep 1889, d. 06 Oct 1918, killed on Hindenburg Line, Co. “L” 117th Inf., 30th Div. Culp, Grace Pearl; b. 25 Sep 1910, d. 06 Dec 1910, daughter of B.S. & Anna L.
Culp, Nannie; b. 17 Mar 1855, d. 13 Jul 1929, wife of J.M. Culp, Sallie Ann; d. 10 Dec 1871, daughter of D.H. & M.E. Culp, Sallie; b. 20 May 1862, d. 17 Oct 1920, wife of A.J. Golden, Hartwell; b. 20 May 1905, d. 25 Sep 1906, daughter of W.B. & M.E. Golden, Infant; b. 18 Nov 1907, d. 22 Apr 1908, daughter of W.B. & M. E.
Lineberry, Willie Amos; b. 16 Sep 1890, d. 27 May 1893, son of Sam & Mary A.
Pevahouse, Ada (Adams); b. 1879, d. 1936, wife of Joseph N.
Pevahouse, Ada; b. 09 Aug 1914, d. 02 Sep 1938, daughter of G.W. & M.M. Pevahouse, Elijah M.; b. 31 Jul 1877, d. 25 Sep 1879, son of G.L. & H.O. Pevahouse, Harriet O.; b. 05 Feb 1852, d. 20 Jan 1902, wife of G.L. Pigg, Donie A.; b. 1894, d. 1981, wife of George T.
Pigg, Sallie A.; b. 07 Dec 1884, d. 22 May 1906, wife of J.W. Pulley, Leevona (Culp); b. 24 Jan 1932, only date, wife of Joseph L.
Smith, Matilda (Craig); b. 13 Sep 1831, d. 30 Jan 1911, wife of John L.
Turnbo, Ruberia Carrie; b. 26 Mar 1931, d. 24 Nov 1932, daughter of G.A. & F.D. Warren, Addie May; b. 06 May 1898, d. 06 Oct 1900, daughter of J.B. & F.B. Warren, Douglas A. ; b. 27 Dec 1942, d.. 07 Feb 1943, son of N.B. & M.A. Warren, James B.; b. 16 May 1862, d. 01 Nov 1901, husband of F.B. Wilson, Pennie; b. 07 Apr 1851, d. 08 Oct 1909, wife of James G.
The following persons are interred at Culp Cemetery with no identifiable marker. These names were included in the 1971, 1981 & the 1983 enumerations & were contributed by J. Erving (now deceased) & Ermadine Riley.